Spring is in the air, and with spring comes wedding season. Vibrant flowers are starting to bloom, leaving you with endless options when it comes to your wedding flowers. Here, get some gorgeous ideas that are perfect for this season. 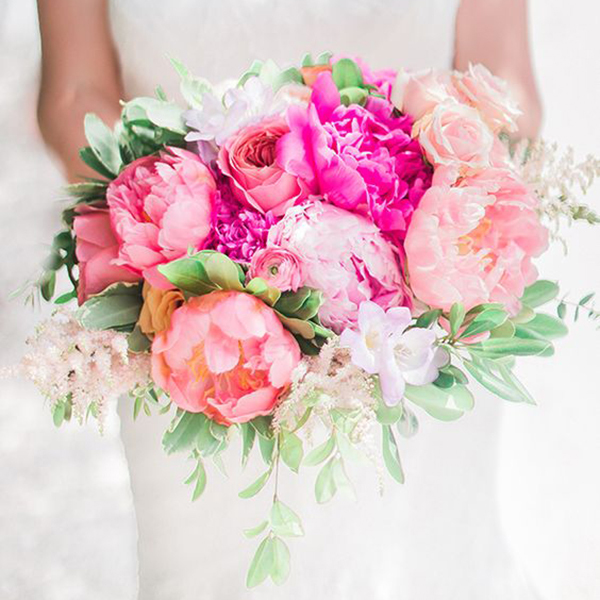 Mixing textures and tones adds interest to your pink bouquet. A bouquet filled with garden roses and dusty miller screams romance. A soft bouquet of peonies is a gorgeous choice for the season. Highlight your bouquet with hot pink against soft blush and cream. Take advantage of colorful fillers, like heather, lilac, and berries, to fill out your bouquet in style. Combine dark and light pink roses with daisies for a fresh spring bouquet. Fill your bouquet with mixed greenery for a modern touch. Spring isn't all about bold colors; these soft bouquets play beautifully against a neutral color palette. You can never go wrong with classic white and light pink roses. Creative accents, like succulents, add visual interest to a muted bouquet. A few colorful accents add pop against a classic bouquet. Make an overflowing bouquet filled looks cohesive by keeping everything within the same color family. Give your bouquet a whimsical touch with billy balls. A loose bouquet gives off a fresh-from-the-garden vibe. Split leaves and King Protea give this classic bouquet a tropical touch. A wildflower bouquet is perfect for the free-spirited bride. Unexpected greenery, like sprigs of evergreen, give your bouquet a unique touch. Put greenery in the spotlight with various leaves intertwining a classic bouquet. Purple is the hottest color of the year, but it also never goes out of style. Include varying shades in your bouquet. Understated purples give off a romantic, vintage vibe. Choose contrasting colors, like blue and orange, to really make your bouquet pop. Soften up your contrasting bouquet with some traditional pink and white roses. This colorful blend of spring flowers is simply perfect for the season.